A vastly interesting concept within mechanical engineering (as well as many other fields of engineering) is that of stability, which takes many forms, so today we are going to focus on a form of stability that would perhaps be more common within naval architecture/engineering, namely: hydrostatic stability of submarines. Hydrostatic refers to the application of water-based fluids mechanics (mechanics comprising of statics and dynamics) to situations in which there is no fluid (or in the case of hydrostatics, water) flow; this is to say that the fluid is stationary (or static, as opposed to dynamic). This truly is a topic you could spend a lifetime studying, and as such, I am only going to give a very brief primer on the category (with nearly enough pictures to rival the word count of the article!) to the end of revealing just how much consideration goes into something that most people would never stop to think about. First off, let’s explore what we know about stability, even if we have never taken an engineering class on the subject. What do you think of when you hear the word stability? Perhaps you envision trying to balance on an exercise ball, or maybe trying to balance (hopefully successfully) your dinner plate in one hand while trying to keep the family dog at arm’s length to keep her from eating your food when you go to sit down, or maybe you think of that uncomfortable flight home for Thanksgiving with the airplane pitching, rolling, and yawing all over the place; these are all forms of stability and can each easily be complex enough of phenomena to spend an entire career studying! Just as in an airplane, where you have to worry about controlling any inherent pitching, rolling, and yawing for stability of the aircraft, in a submarine, you have to worry about controlling rotations about these same three axis: lateral (from port to starboard side), longitudinal (from the bow to stern), and vertical (from the bottom on up). One big distinction between the stability of aerial, ground-based, and surface (ships) vehicles and that of submarines, is the fact that submarines have two very different modes of hydrostatic stability: surfaced and submerged. Surface hydrostatic stability refers to how stable the submarine is when it is sitting on the surface (important to note, that if the submarine are moving on the surface, this would be hydrodynamic stability, not static, which opens up a whole new can of worms to deal with). On the surface, submarines are inherently unstable, the main reason being the shape of the submarine. Submarines are essentially shaped like cylinders with dome-like caps; this is done for hydrodynamic reasons, including, but not limited to streamlining, or the reduction of drag by utilizing a shape that influences the external fluid flow to be smooth (this is analogous to how you have probably heard people talk about how ‘aerodynamic’ their car is/isn’t). Now, when we take our submarine and drop it in the water, we encounter something known as Archimedes’ Principle, which states that the buoyant force (the force that the fluid/water is exerting upwards on the body) and the weight of the displaced fluid (water) are equal in magnitude and opposite in direction. When we have only a small portion of the submarine below the surface, the center of buoyancy (i.e. the center of the displaced fluid) is much lower than our center of gravity, making our submarine easy to tip over (perhaps while playing soccer or football, or some other sport, you have heard someone say that someone else who has a heavy build and is average to lower height is ‘hard to tip over on account of their low center of gravity/mass, which is not exactly the same as this situation, but ought to aid in understanding). Think about if you were to go float in the pool and take a big rock (please don’t try this at home, as it could be quite dangerous) and hold it high over your head straight up in the air. If you held it straight up, you would probably be pretty stable, but if you were to pivot your arms so that they were no longer directly above your head, the rock would carry them through further rotation and you would find a new stable position with the rock underneath you. Now, if our submarine was submerged, then we have displaced our entire volume’s worth of water, so that the center of buoyancy (CB) now lies in the center of the cylinder. Submarines are typically designed to have their center of gravity (CG) near (or a little lower than) the center of that cylinder, thus when fully submerged, their centers of buoyancy and gravity nearly coincide, leading to a very stable state (think taking the rock from earlier and hugging it against your chest while underwater, you no longer feel like you’re going to tip over!). This is a major consideration in submarine design that gets very complex, especially when you realize that you can have this CB-CG offset in all three directions (lateral, longitudinal, and vertical)! To make matters worse, every time you add anything into the submarine, its own CG affects that of the submarine, requiring the use of ballasts to relocate the CG. 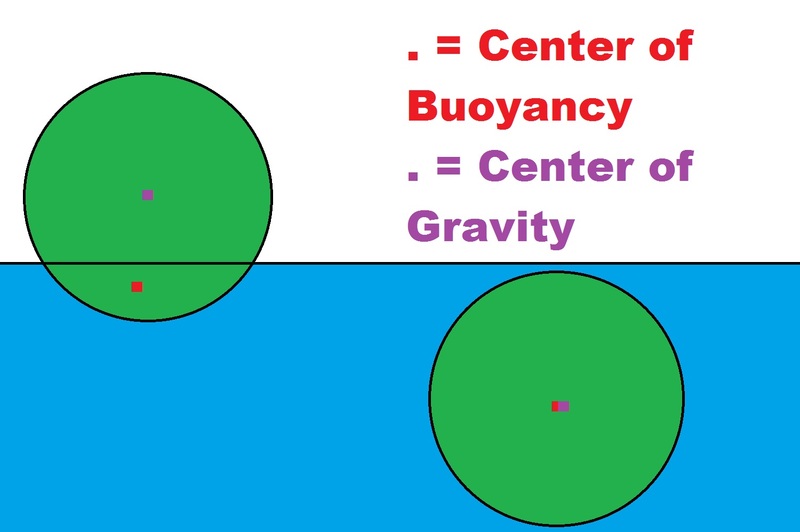 Centers of buoyancy and gravity for surfaced and submerged states. Hydrostatic stability was the meat of this article; however, while hydrodynamic stability (as well as the unabridged discussion of hydrostatic stability) is beyond the scope of this article, it will be quite educational to comment on this next subject real quick. As we saw before, the big fight with regards to submarine stability involves balancing the effects of buoyancy and gravity in 3-Dimensional space. Well, what do we do when the submarine is moving and needs to remain stable? This is where control surfaces and variable ballasts come into play. Variable ballasts are essentially tanks that you can pump water into/out of to shift the position of the CG & CB on the fly. This technically could be used for controlling submarine movement, but more often than not is used to accomplish tasks such as surfacing and submerging (and can also be used to dictate the rate at which this happens). It is interesting to note, that not even this is an easy design task, as there are a ridiculous amount of things to consider, all the way down to location of the valves/vent holes (air vents up top to make sure no air gets trapped in the tanks, changing CG/CB; water valves down low to make sure all of the water can be pumped out, once again to control effects on CG/CB). Rather than purely use the ballasts for steering/motion control, submarines use their control surfaces and a special type of variable ballast called the trim tanks. The control surfaces point the submarine in the right direction, while the trim tanks adjust trim/attitude, or the angle at which the submarine is pointed upwards or downwards. As a last note on hydrodynamic stability, I want to relay the fact that the information above seems to neglect quite a few other effects. It seems this way because it is this way; there are endless possibilities for how the fluid flow may interact with the submarine to affect stability. 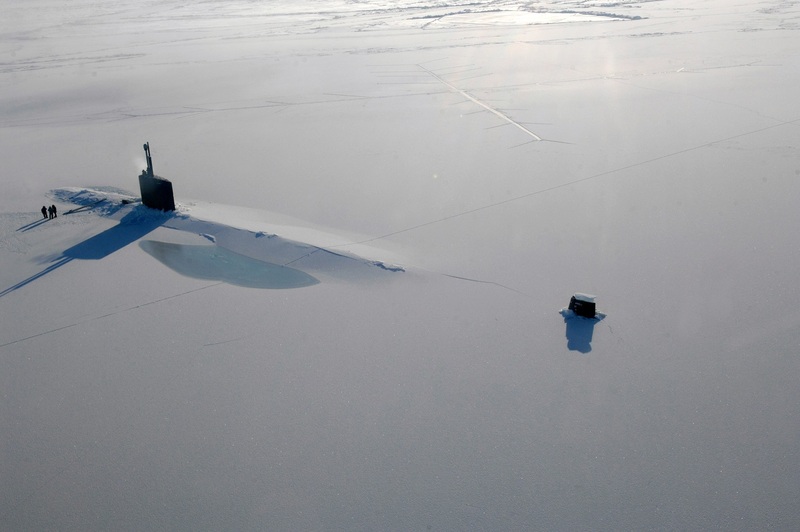 The topmost (main) picture of this article, which shows a submarine surfaced during polar operations demonstrates the fact that surface stability also has to account for things such as punching through three feet of ice and then remaining seated against it or perhaps the effect of wave impact on a surfaced submarine (it should be noted that along with stealth, waves and other surface effects are among the main reasons submarines do not travel long distances on the surface, especially in rough weather!). Well, that is more than the average person ever hoped to know about submarine stability, that much I am sure of, but I hope that you have enjoyed learning along with Team UV. Please check back for our next post on Sunday (an Open Mind post by Andrew) and our Veteran’s Day salute this upcoming Tuesday. 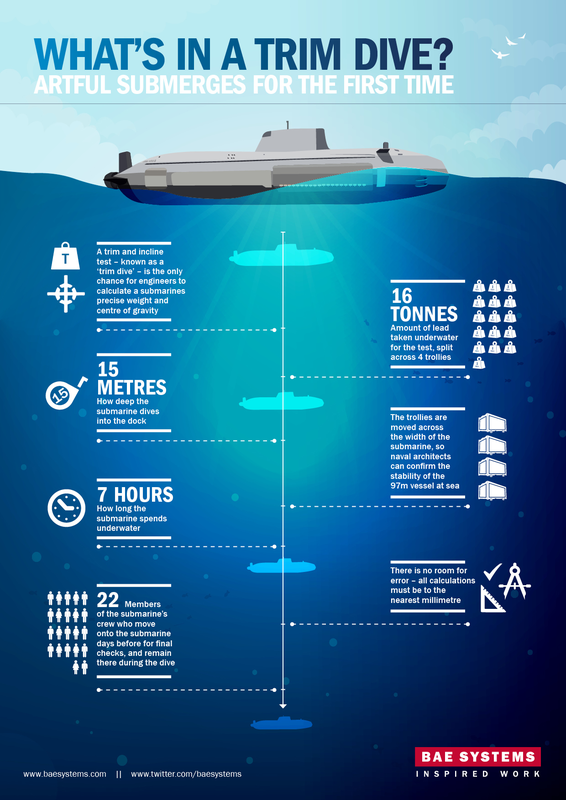 In closing, I will leave you with a really cool info-graphic put together by BAE Systems showing some of the work that goes into actually determining the location of a newly designed submarine’s CG & CB! BAE Systems Artful submarine CG/CB testing. THIS IS UTTER RUBBISH; that would give a submarine that would spin freely in the water! The CofG must be well below the CofB to achieve stability. Firstly, we would like to ask you to respectfully state your opinion in kinder terms in the future, as that is how our comment sections are run. If you respond back with the same level of rudeness, your comment will not be approved. Furthermore, regarding your assertion that the submarine would spin freely: you are neglected some very important submarine features. Namely, you are neglecting the inclusion of non-uniform hull shapes, decks, and perhaps most importantly control surfaces (both fixed and variable position), which are detailed lower down in the post. All of these control surfaces help to stabilize the vessel and resist everything from transmitted torque to deep ocean currents. Believe me, I am speaking from both knowledge and experience regarding this. In short, you are not correct in your assertions, and I hope the above discussion can help clear that up, but (as I said before) I would be more than happy to point you towards much more detailed sources for further clarification, as I am a bit too busy to explain this whole thing on here, unfortunately. There is one thing that you have helped with, however, as I noticed some confusing wording (that was representative of a bit of an idealized state) in the post now that you quoted it and will be changing the wording to make things more clear, so thank you for that and enjoy your day. As always, thank you for reading and commenting!